'Despite Modi's high-flown rhetoric about good-neighbourly relationships in South Asia, he lacks a road map how to proceed -- be it with Bangladesh or with Sri Lanka and Pakistan... But a deeper question arises here: Did he duck on his own accord or under the diktat from the RSS, asks Ambassador M K Bhadrakumar. The justification being proffered -- that Pakistan's ambassador in Delhi inviting members of the separatist Kashmiri separatist Hurriyat Conference meet up with him -- belies logic and lacks credibility. For over two decades already -- including under a previous Bharatiya Janata Party government -- Delhi allowed discourses to take place between Pakistani officials and the Hurriyat leaders. So, what is it that the Modi government is proposing? That Pakistan should give up its stance on the Kashmir issue? That Pakistan should keep the Hurriyat at arm's length? But that is a churlish argument since Baluchistan is not an India-Pakistan issue at all; it is Pakistan's internal problem, and if India were to hobnob with Baluchi nationalists, that will be blatant interference in Pakistan's internal affairs. Whereas, Kashmir is an India-Pakistan dispute and there is a file on it in the UN archives. Yet another silly argument being touted by our 'hawks' is that the domestic politics in Pakistan has destabilised the elected civilian government in Islamabad and it is advisable that India sat on the fence until things clarified. But then, when is it in these past 67 years that Pakistan has been in a state of absolute domestic bliss? 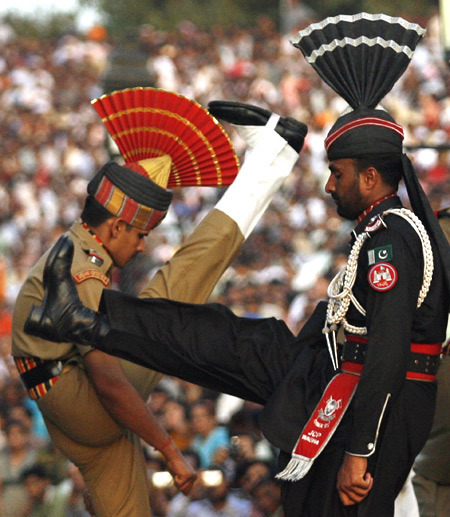 India has dealt with Pakistan through good and bad times in that country's internal politics. A third lame excuse being advanced is that Pakistani army is indulging in provocative acts on the border lately and added to the invitation to meet the Hurriyat, there is reason to believe that the 'powers that be' in Pakistan do not want any meaningful dialogue to take place. Paradoxically, this is an argument that ought to justify the raison d'etre for engaging Pakistan today. By refusing to engage the civilian government in Pakistan, Delhi is only playing into the hands of the hardliners in that country. Clearly, therefore, what emerges is that the Modi government has taken this fateful decision on next week's talks with Pakistan for reasons other than what it is advancing. The heart of the matter is that despite Modi's high-flown rhetoric about good-neighbourly relationships in South Asia, he lacks a road map how to proceed -- be it with Bangladesh or with Sri Lanka and Pakistan. Suffice to say, a constructive agenda is lacking for Monday's talks and Indian Foreign Secretary Sujatha Singh would have twiddled her thumbs in Islamabad in the absence of a mandate from the Indian leadership. Put differently, Monday's talks held the danger of exposing Modi's carefully cultivated image of being a visionary in a common South Asian home. Unsurprisingly, Modi ducked at the penultimate hour. Unlike the other two RSS demands -- a common civil code and a temple in Ayodhya -- this one is entirely 'do-able' if the BJP succeeds in forming the government in Srinagar. Nay, the RSS will insist on it and as a good pracharak Modi will have no option but to comply. Looking back, Modi's Leh speech last week was a harbinger of the shape of things to come. And, herein hangs the tale of the scuttled foreign secretary level talks. Both Delhi and Islamabad are anticipating gathering storms on the horizon. Modi's inaugural bash already looks a distant dream, as ancient passions take over. With Afghanistan on the boil and regional security situation being so fragile, the international community would have reason to feel concerned if India-Pakistan tensions were to escalate. The US reaction has been one of 'disappointment' over Modi's decision. India cancels talks with Pak. Do you agree with the decision?